Enjoy the comfort of a warm living room surrounded by the beauty of nature with this Amish handcrafted Rustic Log Fireplace with Mantel. This stunning piece of American made furniture will bring a rustic homey feel to any room while keeping your family nice and warm on those cold winter nights. With 1000 square feet of heating capacity, the electric fireplace insert provides plenty of heat to warm an entire room. Choose from a variety of rustic wood types, each with its own set of characteristics to match your personal style and home decor. These unique wood types include pine, rustic pine, red cedar, and aspen wood. Also, select the two drawer style, which adds full-extension drawers into the base of your fireplace to provide extra storage for your household essentials. This Rustic Log Fireplace will surely be the focal point of your living room and will bring a sense of pride to your home. 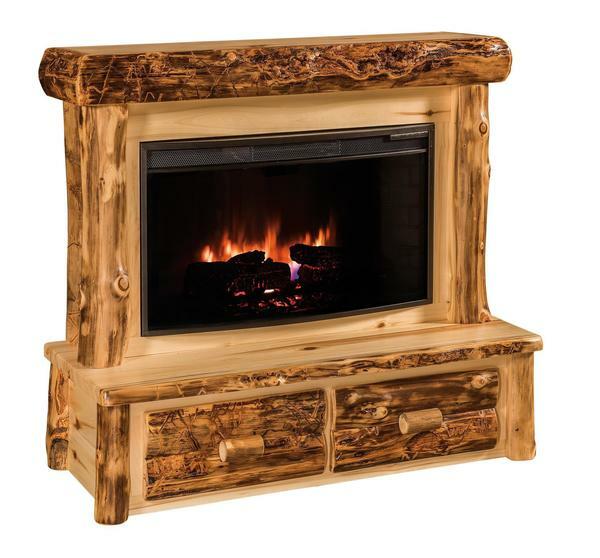 Contact one of our friendly and knowledgeable Amish furniture consultants for additional information or custom ordering assistance on this stunning Amish Rustic Log Fireplace. Comes with a remote for heat and flame adjustments.